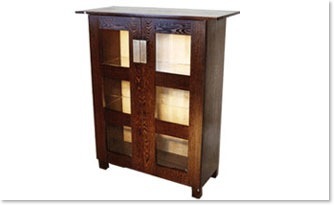 CB03 -A small solid oak cabinet with original inverted walnut handles. 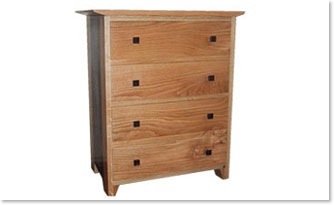 Includes handcut dovetails in the drawers with a dark wood drawer side for contrast. 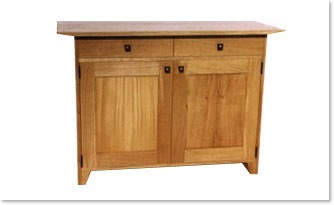 CB04 - Sideboard unit made from solid oak available in a variety of sizes with options for handles and inlay. 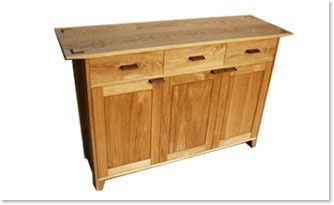 CB05 - An oak sideboard with 4 central drawers with solid wood throughout. 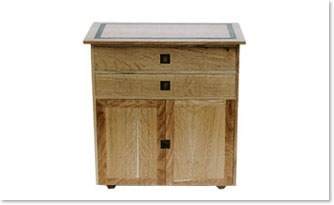 Available with inlaid walnut to add contrast and there are optional handcut dovetails in the drawers. 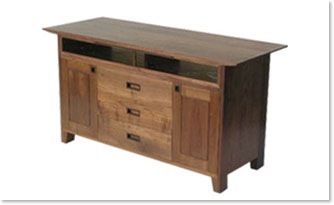 CB06 - Walnut and rosewood sideboard with bronze glass flap for the discreet storage of audiovisual equipment. 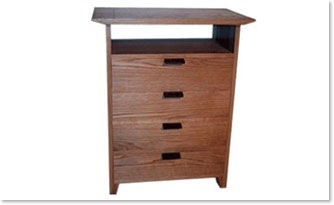 Available in a variety of design configurations and wood types. CB07 - A large versatile storage unit made from solid cherry and also available in a variety of design configurations and wood types. Drawers all finished to the highest cabinet making standards free running on solid wood internal frame. 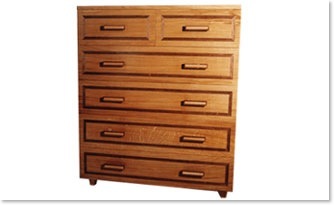 CB08 - Large chest of drawers for high storage capacity with inlaid walnut designs in the solid oak. Available in a variety of sizes and wood types. 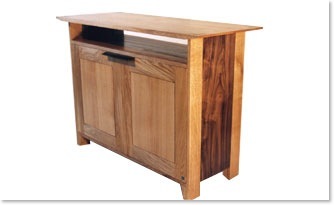 CB09 - A drinks cabinet made from solid wenge and sycamore. Touch sensitive internal lighting available. 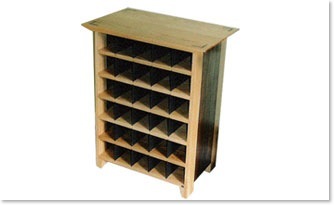 CB10 - A wine rack made from solid oak and blackened steel with walnut panels in the side. Available in a variety of wood types and sizes. 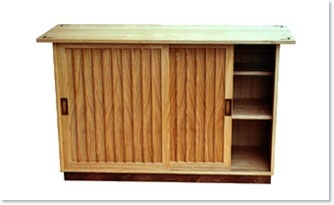 CB11 - A cabinet that uses the Japanese tradition of sliding doors and the style of slats in the doors for decoration. The cabinet shown was made from a mixture of walnut and oak and is also available in a wide variety of sizes and wood types. 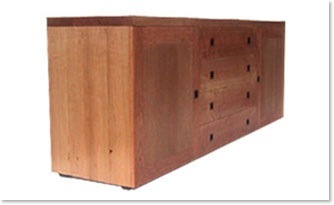 CB12 - A cabinet made for storage with adjustable internal shelves and also internal drawers. 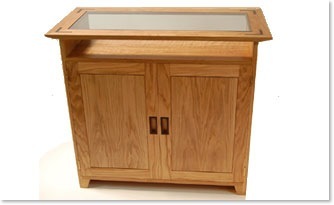 The top has a glass insert and there are some touches of rosewood to contrast with the oak. 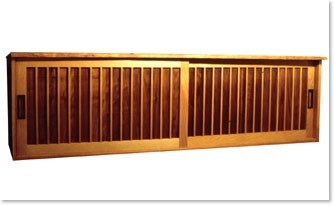 CB13 - Sideboard with three drawers and three lower cupboards all with adjustable lower shelves. Walnut used for contrast in the handles, side panels and in the top panel. CB14 - Low storage unit with sliding doors made from oak with a walnut panel behind the oak slats．The top is made from a waney edged board and all the joints were made with handcut through dovetails.